The Arlington County Board unanimously adopted the Community Energy Plan (CEP) as a new element of the County’s Comprehensive Plan in June 2013. The plan set ambitious community energy goals to achieve 75 percent reduction in greenhouse gas emissions by 2050. All of AIRE’s efforts support the CEP’s goal while trying to educate the community about making smarter energy decisions. Create a script that would enable our trained outreach team members to have an informative and effective conversation with Arlington residents that would allow them to make better energy decisions. Produce a video that highlighted the work AIRE had done in their initial outreach efforts as well as executing the light bulb swap events in strategic locations that would ensure success. Designed AIRE’s outreach table setup to encourage conversation. Utilize our trained outreach team to share details about AIRE – and helpful energy saving tips – at every AIRE event. 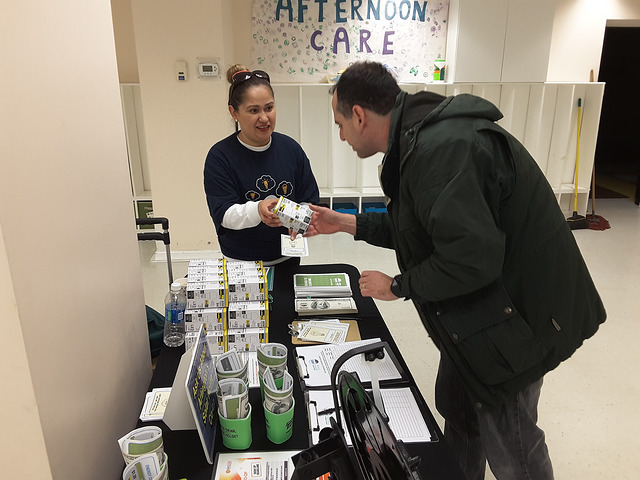 We placed our outreach teams at strategic locations for AIRE’s light bulb swap events. Since 2014, we have exchanged 3,970 incandescent light bulbs for LED bulbs, saving Arlington residents a total of $24,058 in energy bills. The video we created for AIRE – The 2015 Energy Journey: AIRE’s Life-Size Board Game– showcased AIRE’s interactive energy game events in an informative and dynamic format. Participants make everyday choices, from dailythermostat settings to seasonal investments, to “win” at smart energy use. The video is featured on Arlington County’s YouTube channel and is embedded on AIRE’s website.